The present boundary of St Edmundsbury was established during the local government reorganisation of 1974. The history of each part of the Borough's varied landscape, however, has been inextricably intertwined for centuries. A rich picture of generations of human history is painted by the buildings, monuments and even the pattern of the hedgerows. Traces of Stone Age hunters at Barnham and Bury St Edmunds tell of the first farmers, working the rich soils of the north of the area. Dozens of Bronze Age barrows remind us of later herdsmen who cared for their animals on the same land. The clay areas of the centre and south of the Borough were opened up by the Romans, with Ixworth and Pakenham at the centre of a network of roads and villa estates. An important Romano-British settlement was discovered at Haverhill. Before the collapse of the rule of Rome in Britain in the early 5th Century, the first Saxon settlers had arrived from Holland and the Jutland peninsular, bringing with them a new culture. An important site on the banks of the River Lark at West Stow, seven miles north of Bury St Edmunds, has been excavated and reconstructed to show how Anglo-Saxon village life might have been 1,500 years ago. Thousands of finds from the Saxon and earlier periods are on display among the archaeological collections of Moyse's Hall Museum in Bury St Edmunds. Moyse's Hall itself represents a later, Norman, era, and is the oldest residential building in the town. A new Anglo-Saxon Centre was opened at West Stow in 1999 and many exciting finds from that site and other local sites are on show there. From its humble Saxon beginnings, Bury St Edmunds became home to one of the most powerful Abbeys in mediaeval Europe and has seen glory, turmoil and scandal over the centuries of which few small towns can boast. Today, it remains a busy and beautiful market town at the heart of East Anglia. 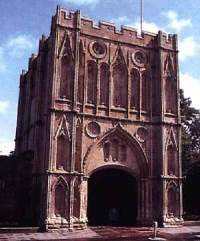 In essence, Bury St Edmunds is a mediaeval town which grew up around the gates of the Benedictine monastery founded in 1020 AD by Cnut - the celebrated king, better known as Canute, who sat on the shore and commanded the tide not to come in. It retains a Norman town plan, in which the main streets led to the Abbey precinct. The Abbey's rise to fame came about because of the martyrdom of King Edmund and his subsequent burial there. A devout Christian, Edmund was captured by raiding Danes and shot full of arrows when he refused to renounce his faith. His head was cut off and thrown into a wood. When his friends came looking for him, legend has it that the severed head called to them, and they found it guarded by a wolf. The arrows, the wolf and the crowned head still form the coat of arms of the Borough of St Edmundsbury. St Edmund was also the Patron Saint of England before dragon-slaying St George took up the title. By the time of the Norman Conquest of 1066, the Benedictine Abbey where Edmund's remains were laid had already been renamed St Edmundsbury. Under the authority of a succession of astute Abbots, the Abbey became a force to be reckoned with. It was at the high altar that the 25 barons swore an oath in 1214 to force King John to ratify the Magna Carta, which he later did at Runnymede in Surrey. The Magna Carta forms the basis of democracy as we know it in Britain - and in many other English-speaking countries - today. Despite a series of riots and rebellions among the townsfolk in the 14th century, Bury St Edmunds developed into a prosperous market town with a thriving clothmaking industry, and it enjoyed royal recognition. St Mary's Church was completed in the 1427 and it is here that Mary Tudor, sister of one regular visitor, Henry VIII, is buried. With Henry VIII's dissolution of the monasteries in the early 16th century, the Abbey was finally raided and torn down. Its remnants are all around the town, standing as ruins or built into the homes of opportunist townspeople. The Abbey Gardens surround many of the ruins, and are the town's most popular attraction, winning prizes in international floral competitions. Many secular mediaeval buildings such as the Guildhall still stand, but most are hidden behind elegant 17th and 18th century facades. It was in 1606 that King James I incorporated the town, and a crest was granted. Life in the town went on, and its array of splendid Georgian buildings are a testimony to its prosperity in the 18th century. The Athenaeum opened in 1714 as Assembly Rooms and has been a centre for social life ever since. The Manor House Museum on Honey Hill was built in 1736 for the Earl of Bristol's family, whose country seat was Ickworth House in nearby Horringer. The Manor House opened in 1993 as a museum of art, fashion and horology. Author Daniel Defoe described Bury St Edmunds as a town famed for its pleasant situation and wholesome air, the Montpelier of Suffolk and perhaps England. Bury was largely unaffected by the Industrial Revolution and unlike many British towns it did not grow to any extent during the 19th century. Its most impressive Victorian building, the Corn Exchange, is still in use but the weekly corn market ceased in 1997. Charles Dickens was a regular visitor to the town and in Pickwick Papers he calls Bury St Edmunds a handsome little town, of thriving and cleanly appearance. Dickens' description of the town could apply today. It has much to offer people of all ages and interests, with an excellent range of cultural, sporting, leisure and shopping facilities. Dickens stayed at The Angel Hotel, where the Dickens Suite is still available for patrons today - including the very bed in which the great writer slept. A new diocese of Ipswich and St Edmundsbury was created in 1913, and the Church of St James was chosen as the Cathedral. It is today the only unfinished Cathedral Church in the country, lacking the spire it was always intended to have had. Spire notwithstanding, the Cathedral plays host to numerous large-scale ceremonies throughout the year, while nearby St Mary's provides the setting for the Borough's main civic occasions. Despite the controlled expansion of the twentieth century, with high-technology industries developing on the outskirts alongside the traditional occupations of sugar manufacture, brewing and agriculture, Bury St Edmunds retains its character as a charming and peaceful market town. Haverhill is the second largest town in the Borough, lying on the A1307 between Cambridge and Colchester. It has the proud distinction of having been a market town for 950 years. However, it was through the textile industry that the town became prosperous, particularly in the latter part of the 19th century. This industry can be traced back to the 1660s, and even then it was being described as a 'great trade' in the town. By the end of the 18th century, the cloth trade was in decline, in Haverhill as in other parts of East Anglia. It was revived by the introduction of two new fabrics, silk and drabbet. Drabbet, a coarse and hard-wearing linen-like material, was used for smocks, the working clothes of most rural workers. Whilst silk brought only modest wealth and then went into decline, Haverhill became famous for its drabbet smocks. The great watershed in Haverhill's history was the building of a factory containing 32 power looms by D.Gurteen and Sons. This company, who had been in the town since the 1780s, went on to expand and Haverhill prospered alongside, becoming the fastest-growing town in West Suffolk. Between 1851 and 1901 it almost doubled in size, and this growth produced a complete Victorian town with new houses, schools, churches and public buildings. It was the Gurteen family who built the Town Hall, now a thriving Arts Centre. The town has gone on to quadruple in size between 1951 and the present day, following its nomination as an 'expansion town' by the Greater London Council. Whilst fire destroyed most of Haverhill's older buildings in 1665, Anne of Cleves' House - which once formed part of the dower of the Queen Consort of England - has been completely renovated. In the south of the Borough, Clare is a lovely market town, with an array of antique shops, art galleries, coffee houses and traditional pubs. At the time of the Norman conquest, Clare was one of only six boroughs in Suffolk. It was given by William the Conqueror to his relative Richard de Bienfait, the first Earl of Clare. Members of this family played an important part in national history; they were involved both in the drawing-up of the Magna Carta, and in the calling of the first popular parliament. During the 16th century, Clare's affluent population grew rapidly. The parish Church of St Peter and St Paul, built in 1450, reflects the great wealth of the community in those times. The town's fine architectural legacy also includes the Ancient House, opposite the church, timbered and pargetted facades along the streets, and the 13th century priory.